The CameraTrapCodger has dobbed me in on this one. It stems from Jochen’s Bell Tower Birding invitation to post a fun bird blog and label the illustrations with only 6 words. Then pass on to another set of recipients with the same invitation. Well I’ll leave that to you readers and I’ll just provide a few of my favourite pix. “Fluffy, Cuddly, Friendly, Silkie Egg Factories”. Until moving to the tropics, I always had chickins “Chooks” in Australia. 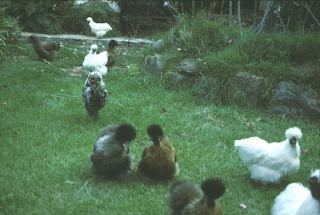 Japanese (or Chinese depending on your references) Silkies are everyone’s favourites. They are comical, friendly and very “user-friendly" when it comes to the garden. But in the tropics we have problems they don’t have in temperate suburbs—snakes—and big snakes. Pythons just love Japanese Silkies. [Pythons will be the subject of up-coming blogposts, so stay tuned.] And they get almost every chook that you might keep. So—no chooks in Kuranda, it’s just too heart-breaking. “Little Elmer- Friend for 14 years” Little Elmer was a Silvereye, Zosterops lateralis, we found in an abandoned nest late one cold November night. His mother had been frightened away and he was left to die. But we saved him and fed him on a mixture of food suggested by the Camera Trap Codger some years prior to our find. He lived in the house for 14 years and we learned a lot about Silvereye behaviour watching him. I thought that our guest might have been heading for a longevity record, but after discussion with colleague Michael Lenz, we discovered that banded Silvereyes had been captured some 11 years after having originally being caught. So that would mean that they had been alive for longer than that, perhaps several years before hitting the mist nets. If you want to learn more about Silvereyes just have a look at this site on Silvereyes. “Aviary Days-Fun in New Jersey”. I did live in New Jersey for 5 years from 1970-75 in a wonderful area known as the Pine Barrens. This area of natural vegetation had a unique mixture of flora and fauna. 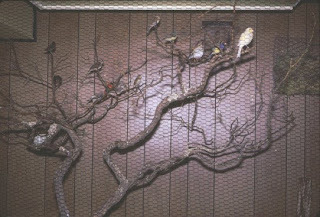 We had an indoor aviary of exotic birds. 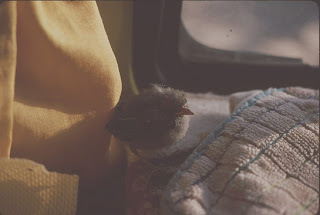 At that time it was possible to go to the pet shop and buy all sorts of exotic birds, many of which were wild-caught. These days, and especially in Australia, this would be unthinkable. You can see in this picture a beautiful Lady Gouldian Finch. Little did I realise that some 35 years later I would be living in Australia and within 100 km of where these birds occur naturally. What a place! A large male King Stag Beetle with enlarged mandibles. Males try to pass under each other’s body in an attempt to dislodge the rival. If done on a vertical substrate, the rival may be thrown into the air, otherwise it may be rolled. Tarsi and legs may be lost in the conflict. Mandibles may also be use in mating to lever a female or carry her elsewhere! Wood et al (1996). A “minor” male King Stag Beetle characterised by very short mandibles. Perhaps, this individual would not be successful in competing with other males during courtship. A male Cacostomus squamosus Newman. Other males, above and below of C. squamosus. Prosopcoilus torresiana (Deyrolle) is a species that is not very spectacular in appearance. It sits motionless on the light sheet. 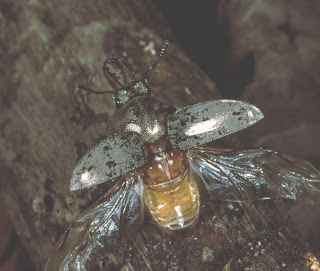 Lamprima spp. stags are diurnal and are found on flowers. They are most commonly found in eucalypt woodlands and not generally associated with rainforests. 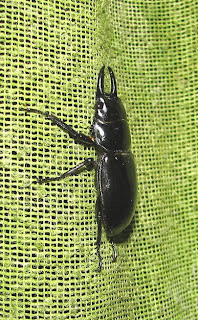 Stag beetles are a group of about 1,200 species of beetle in the family Lucanidae. Some species grow to 8 cm (3¼ in), but most are about 5 cm (2 in). The English name is derived from the large and distinctive mandibles found on the males of most species, which resemble the antlers of stags. A well-known species in much of Europe is Lucanus cervus, referred to in Britain as "the" stag beetle is probably the origin of the common name. 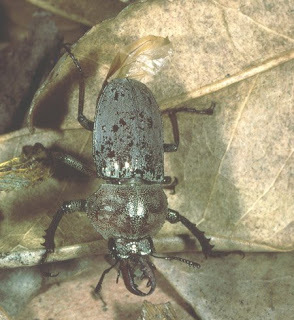 Stag beetles are common in many forests throughout Australia. There are about a half dozen species in the rainforests around Kuranda. The most spectacular is the King Stag Beetle, Phalacrognathus muelleri (Macleay). Its biology and natural history has been documented by Wood et al. (1996). It was first described in 1885 by Sir William Macleay on the basis of a female from north Australia. Macleay was happy to name it after the Victorian colonial botanist, Baron Ferdinand von Mueller. Macleay thought it was the most beautiful insect he had ever seen. 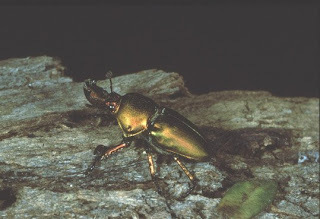 The larvae of Stag Beetles live in dead logs where they are found in the rotting wood. The larvae of King Stag Beetle were originally associated with decayed Red Cedar Toona ciliata (F.Muell.) Harms logs. However, Wood et al. (1996) showed that this was an incorrect association. In fact, the beetles have been found in decaying wood, both standing and on the ground, of over 20 species of rainforest trees. The larvae seem to actually feed on white rot fungi which are present in the decaying wood. Adults of the King Stag Beetle are nocturnal, and they are usually seen flying just after dusk. As adults they feed on fruits and exudates from a number of rainforest trees. These beetles may be attracted to lights during the night, especially black light ultra-violet. 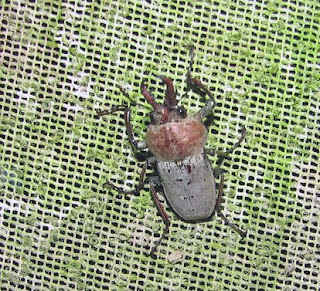 We find around 6 beetles a year around the lights in the garden. I don’t think they are as rare as previously thought. Males can range from 3.5 to 6.0 centimeters on average, though specimens can be as large as 7 cm. Females are significantly smaller ranging from 2.5 to 4.0 cm. A beetle on this site sells for $US850!! And they used to cost much more. There are some lovely photos of this species at a number of sites on the web, many of them Asian in origin. Other species of Stag Beetles at my light trap are much less spectacular and much smaller. Cacostomus squamosus Newman is a common but small species that is a frequent visitor. It is about 2.0-2.5 cm in length and feisty when encountered. It has longer-than-expected legs and sharp tarsal claws. Once firmly attached to its substrate, it is difficult to dislodge. Prosopcoilus torresiana (Deyrolle) has no common name. There are some 84 species recorded in the genus. This one is a very placid beetle that sits motionless on the light sheet with mandibles agape. But it’s just a threat-it doesn’t crunch a finger or twig when provoked. Thanks to Ross Storey for useful discussions. Wood, G. A., Hasenpusch, J., Storey, R. I. 1996. The Life history of Phalacrognathus muelleri (Macleay) (Coleoptera: Lucanidae). Australian Entomologist 23(2): 37-48. 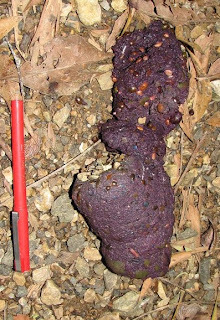 A large “healthy” Cassowary turd filled with many viable seeds that will either grow into new plants or be eaten by other wildlife. The “grey matter” is probably the digested soft pulp that the gut of the Cassowary has rasped from the seeds. There may be considerable clay and gravel that aids in this and the digestive process. It’s a good thing Cassowaries don’t fly! I just washed my car! This offering weighed almost half a kilo. That’s about a pound. 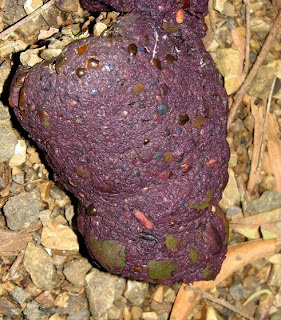 Readers of this blog will recall the “Cassowary poo” item that appeared in July 2007. But this new “deposit” is worth noting again. 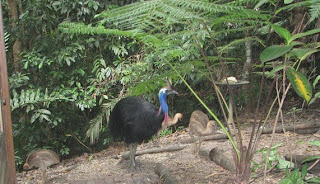 Cassowaries are important in moving the seeds a fruits of rainforest trees to new sites. 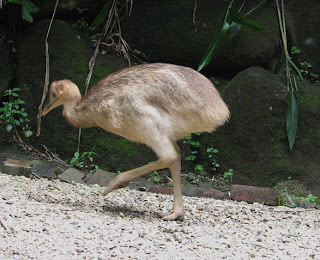 A number of plants need to have their seeds “processed” through the gut of Cassowaries in order for them to germinate. In addition, the “husked” seeds are used as food by birds and rodents. All are important parts of the rainforest web-of-life. The Bronze Orange bug, Musgraveia sulciventris (Stål). Several groups of Bugs (Heteroptera) exhibit parental care to eggs or young (nymphs). Females don’t feed at this time. 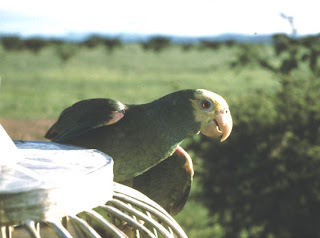 A wonderful review of this phenomenon in Australian species was provided by Monteith (2006). 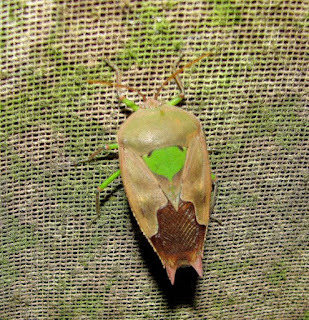 He provides accounts and photos of this activity among a number of bugs but especially the Tessaratomidae. This work should be consulted for other examples of this phenomenon in Australian bugs. 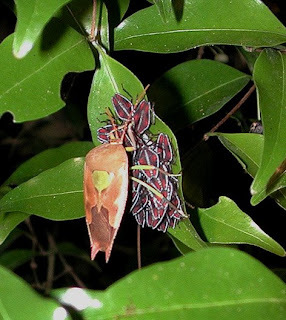 This is a family of over 50 genera and 240 species of large bugs. They are Old World in their distribution with one of the three subfamilies, the Oncomerinae, mainly Australian. The Bronze Orange bug, Musgraveia sulciventris (Stål), is a common Australian example and occurs on native limes. It is a pest of cultivated citrus throughout Australia and familiar to most folk who have citrus trees. Oddly, it is one species that shows no maternal care of eggs or young. A male Tectocoris diophthalmus (Thunberg). A female Tectocoris diophthalmus (Thunberg). A female Lyramorpha parens Breddin gurading her young. A Lyramorpha parens attracted to the light sheet. 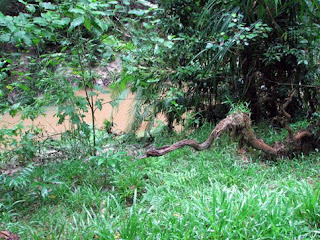 In Kuranda are there are several tessaratomids that we see commonly. Locals refer to them as “stink bugs” for obvious reasons. Lyramorpha parens Breddin is one such bug and Geoff Monteith notes that this species is found in tropical north Queensland with a smaller, more widespread species, L. rosea Westwood occurring along the south-eastern coast from Victoria north to Mt Woowoonga in southern Queensland, Monteith (2006). Where some species of tessaratomids show adaptations to brooding by having a flattened body, L. parens have more or less normal bodies. According to Monteith the eggs are arranged in rows of 6, 6, 7, 8, 7, 6. As you can see, females stay with the young for a long period. The colour of the young is certainly aposematic, suggesting a bitter experience to any bird or lizard that tries to dine on the bugs. Thanks to Geoff Monteith for helpful comments. Monteith G. B. 2006. 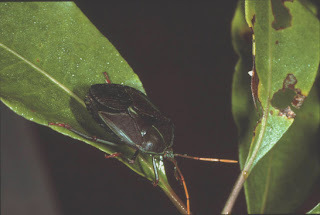 Maternal care in Australian oncomerine shield bugs (Insecta, Heteroptera, Tessaratomidae). Denisia 19, zugleich Kataloge der OØ. Landesmuseen Neue Serie 50: 1135-1152. 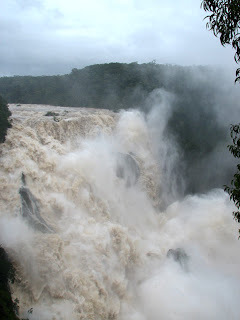 Barron Falls in full flood. See blogs below "Giant Dragons" and "A Dirty Shame" for comparison. Stream on our site with more or less normal flow. During the dry season it may dry up recede to small pools. 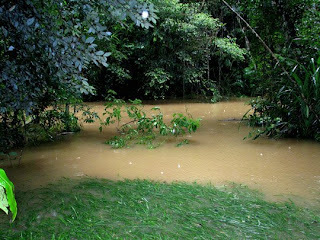 The stream in full flood. Compare with above. A bit of a worry! Wet, Wet and Getting Wetter! In the past 2.5 days we have recorded 500 mm (=20 inches) of rain here in Kuranda. Even elderly locals say that’s more rain than they have seen over a short period in their lifetimes. The culprit is a low that is hovering off the coast near Cairns. Our stream reacts to heavy rainfalls with fluctuations of about 30 feet at times. What happens to the several species of small fish and other aquatic life during such periods? Within a few months, things seem to be restored to normal. This stream empties into the Barron River in less than 500 m and its contents end up in the ocean. 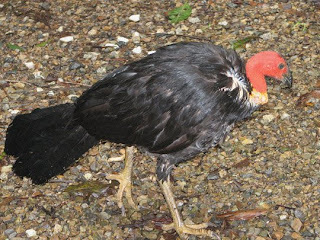 Even the Brush Turkey is soaked to the skin! Milionia queenslandica Rothschild is one of two species of the genus known from Australia. Others occur in New Guinea. It is a member of the family Geometridae. This one occurs along the coast from Cooktown to Innisfail. It’s a stunner, presumably to worn birds that it is potentially toxic. It comes to lights regularly but is never abundant. Three or four individuals would be the average. 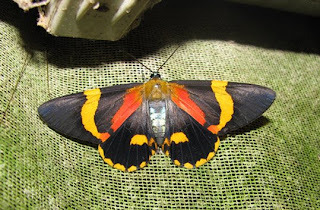 As with so many of the moths from this region, I have never seen one during the daytime. Father Cassowary and the three chicks. 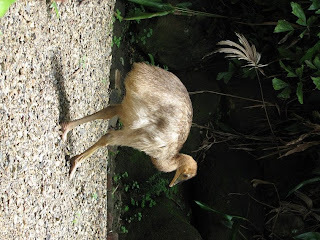 The baby Cassowaries have just about lost all their striping. The stand almost a metre tall but still have their “baby squeaks”. They are not coming around as often as previously. Two or three days can pass without seeing them. There are numbers of forest trees in flower and fruit and the Cassowaries are not as dependent on local residents as before. It has been our experience with local birds and mammals that they quickly abandon feeding stations when natural foods are on offer. The return to normal rainfall patterns has prompted many trees and shrubs to flower and fruit. 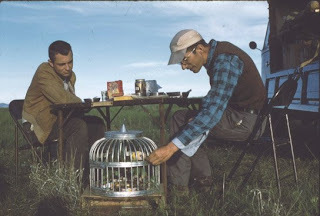 Thus, bird feeders are not so often used and that’s good.